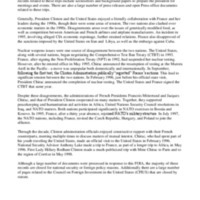 Identifier is exactly "2008-1184-F Segment 2"
This collection consists of records of the National Security Council (NSC) related to France; or trips by the President of the United States or by the National Security Advisor to France. Much of this segment is related to the trips of President Clinton to France. Clinton made five trips to France during his administration: June 6-8, 1994, December 14, 1995, June 27-29, 1996, May 26-27, 1998 and Clinton’s last trip to France was June 16-17, 1999. Many of the open records related to these trips include scenesetters and background papers to prepare the president for meetings and events. There are also a large number of press releases and open Press office documents related to these trips. This collection is the second segment of FOIA 2008-1184-F. The first segment of this collection was released on April 18, 2014.